BEN WATTENBERG: Okay, cue the babies -- smile, girls. Today we take it for granted that kids like these will live to see their first birthday. But back in 1900, more than one of every six American infants -- one in six -- died before the age of one, and mothers were 100 times more likely to die in childbirth than they are today. Tuberculosis was the number one cause of death for women; number two was childbirth. In response to these frightening conditions, women activists rallied the nation to a campaign of reform. To make their case, they reached for the new tools of social science. We continue in Chicago, where in the shadow of the world's fair, new immigrants were redrawing the face of the city. Between 1880 and 1900, the population of Chicago doubled and doubled again. The proportion of the city's residents who were foreign born or first generation American was 78 percent. Cheaply-built tenements defined the landscape. Several families often crammed into a single apartment with little sanitation, ventilation or sunlight. Disease often spread rapidly in the densely populated neighborhoods. The death of an infant from cholera, tuberculosis and even simple diarrhea was a common fact of life. Horrified by the conditions in the city, small groups of university-educated women began volunteer organizations called settlement houses. These dormitory-like homes provided a place where middle- and upper-class women could live and work in the heart of the poorest city neighborhoods. DAPHNE SPAIN (University of Virginia): The voluntary efforts were a way that women were encouraged to identify the city as their larger home. And it was a path into civic improvement and civic activity for women, because if they treated the city as a place that they were responsible for, they had to keep clean, they had to keep healthy for the benefit of their family members, and the community as a family, that gave them opportunities for public actions that they didn't ordinarily have. BEN WATTENBERG: One of the first and most important of these settlement groups was Hull House in Chicago. It was founded in 1889 by the 29-year-old daughter of abolitionist Jane Addams. JANE ADDAMS (1891): "The streets are inexpressibly dirty. The number of schools inadequate. Sanitary legislation unenforced. Hundreds of houses are unconnected with the street sewer. The older and richer inhabitants seem anxious to move away as rapidly as they can afford it. They make room for newly-arrived immigrants who are densely ignorant of civic duty." Jane Addams, 1891. BEN WATTENBERG: For the next 45 years, Addams led Hull House in aiding and educating their immigrant neighbors. One young boy who took his first music lessons at the settlement house was the son of a poor Jewish tailor, Benny Goodman. In 1893, Hull House was hired by the Illinois Bureau of Labor to gather statistics on wages. The women canvassed the entire neighborhood door to door with a detailed survey. The collected data formed the basis of a landmark book, "Hull House Maps and Papers," published in 1895. Using detailed color-coded maps, the volume breathed life into dry statistics. ROBYN MUNCY (University of Maryland): And the map showed you for any building the wages of the residents in that building. And then another map showed you the nationalities of the people in that building, so you could look and see block by block, even building by building, where wages were falling out and which nationalities were stacked next to each other in this ward. BEN WATTENBERG: The nationalities map showed 18 different ethnic groups in the one-third mile neighborhood around Hull House. Italian families, marked in blue, clustered to the north; and Poles and Russian Jews, noted in red, lived to the south. The neighborhood even had its own red-light district. The lots in white indicated brothels, most of which were occupied by native-born women, both white and block, not by immigrants. The wage map showed the average income in the area was only about $7 a week. That's like a family at the end of the 20th century living on about $7,000 a year. The lots in black show that most Italians made less than $5 a week, and were unemployed much of the year. 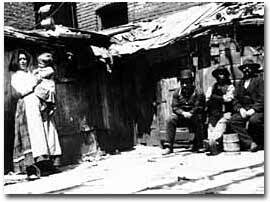 ROBYN MUNCY: And one of the things that the women at Hull House were very anxious to demonstrate was that the people in their neighborhoods were not vicious, that they were not drunken, lazy bums, but were impoverished because of low wages and the conditions in which they worked. DAPHNE SPAIN: They thought that poverty was not a result of sin, but rather a result of social conditions, and that it was society's responsibility to address poverty, both the living conditions and health and welfare. BEN WATTENBERG: Hull House maps and papers used data to make a case for political action. Social measurements helped turn an emotional plea into a focused argument for reform. ROBYN MUNCY: They don't care that people should use that information to spin theories, sociological theories. They're not interested in theories. They are interested in solving social problems. And so women social scientists were continuing a tradition of sociology and economics and political science, social science in general, outside of universities. And that stream of social science thought, that stream of social science practice, continued to marry moral imperatives to the collection of data. WILLIAM FIELDING OGBURN: "Thinking must be free from the bias of emotion. There must be eliminated all the associations that disturb the connection between the thinking and the data." William Fielding Ogburn. BEN WATTENBERG: Ogburn had refined his views while teaching at the two institutions that led the way in the new field of American sociology, Columbia University, and then the University of Chicago, just a stone throw's away from Hull House, at which he occasionally threw stones. WILLIAM FIELDING OGBURN: "Desire has a strong selective influence in causing particular data to be noted and other data not to be noted. Theories suggested by such facts have a strong probability of being untrue in varying degrees, offering false solutions." BEN WATTENBERG: But for Jane Addams and the women activists, collecting data was more than just an academic exercise. Women did not have the national right to vote. Numbers were a source of power. Armed with statistics, women's groups mobilized across the country. ROBYN MUNCY: There were millions -- literally millions of women involved in progressive reform activities in the early 20th century, women not only in the settlement movement, but women in organizations like the general federation of women's clubs, in the women's Christian Temperance Union, the Daughters of the American Revolution, some groups that we much later would associate with conservatism, not progressivism, were in the early 20th century very much a part, in fact central to progressive reform. BEN WATTENBERG: And in 1912, Congress created the Children's Bureau under the Department of Labor. Jane Addams and her network of women's groups persuaded President William Howard Taft to appoint a woman as chief of the bureau. Julia Lathrop became the first woman to head a federal agency. One of the original residents of Hull House and a co-author of Maps and Papers, Lathrop firmly believed in the power of data. 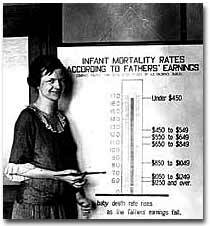 JULIA LATHROP (1912): "We do not know how many children are born each year or how many die or why they die. We need statistics of nativity and mortality. Homeless and neglected children are going to be better cared for, because we are going to do more for all children as we begin to know more about the problems of childhood in general." Julia Lathrop, 1912. BEN WATTENBERG: The Children's Bureau studies reveal that infant death was often caused by unsanitary conditions, contaminated water and by the lack of adequate health care. In homes without running water, infant deaths were 40 percent higher. And as the father's income fell by half, infant mortality doubled. Lathrop searched for an approach that would be both helpful and politically feasible. ROBYN MUNCY: She decides that the education of pregnant women and new mothers would be one of the ways that she might help to decrease infant and maternal mortality. She mounted educational campaigns to help women learn about the value of prenatal care for instance, about the kinds of nutrition that pregnant women need to have, the kinds of exercise that they need to have in order to have a healthy delivery. And she mounted an educational campaign about the healthiest ways to raise babies. BEN WATTENBERG: Lathrop rallied her grass-roots network to lobby for an expansion of the Children's Bureau. And in 1920, Congress passed the Shepherdtowner Maternity and Infancy Act. It would become a model for much of the social welfare legislation of the 20th century. Itinerant nurses sought ought pregnant women and new mothers, setting up wellness tents, examining babies and educating their mothers. Women's groups spread the gospel of cleanliness, proper feeding habits, and the need to seek out a doctor or clinic for advice. Women's club members went door to door to measure infant births and deaths, and then compared the results to local records. They showed that infant mortality had previously been greatly underestimated. ROBYN MUNCY: One of the remarkable things about Julia Lathrop's procedure was the degree to which she involved women in local organizations. She was creating a demand for the collection of statistics. She was involving grass-roots people who had no training themselves in academic social science in the collection of social data, and so was giving that method a kind of authority in American life that it simply had not previously had. BEN WATTENBERG: Social science measurement passed the test of political power. It worked. We can now look back and see what happened over the century. In 1900, for every 1,000 births, 165 babies died. By 1930, that rate had dropped by more than half, and it kept going down. By the end of the century, only 7 babies died for every 1,000 born. Over the course of the century, life expectancy at birth increased from 47 years to 76 years. A baby born at the end of the century will typically live 56 percent longer than an infant born in 1900. A similar trend was apparent among new mothers. In 1900, for every 100,000 births, about 850 mothers died from problems related to pregnancy and child birth. Today for every 100,000 births there are eight deaths. Infant amidst poverty. Courtesy of the Library of Congress. Mrs. Anna Grosser of the U.S. Children's Bureau. Courtesy of the Library of Congress.